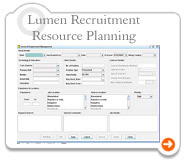 Lumen is a multi-dimensional, placement automation system which covers all the extremes of a Placement agency. It provides various interfaces for Client mgmt, Requirement mgmt, Workflow mgmt, Resume/Candidate mgmt & applicant tracking. The system allows agencies to transfer their data automatically into the Lumen which is stored either in the form of excel Tracker or resumes as an attachment to a mail or multiple resumes stored at a location or Information stored at Job Portals or even the profiles that are applied through Web Site. It automatically extracts candidate information from resume. It integrates Microsoft Outlook/remote mail servers (Pop/SMTP) to enable E-mail capabilities and also integrates SMS Gateways/GSM-CDMA Modems to enable SMS capabilities. It provides some additional features that include E-mailing/SMS to the searched candidates, generation of excel trackers & Reports, Invoice mgmt & Complete Back-Up of the Lumen database from a remote place. It provides some multi purpose Utilities that include Lumen Clip Board, Lumen Chat, Calendar and Reminders. It allows export of the data in the form of MS Excel sheets and MS word/PDF files. Access to various functionalities of Lumen is Right protected hence the system imposes high level of functional security and organizational hierarchy in the company using it. Lumen is a Client/Server based Application product which has been developed using J2EE Architecture and is capable of operating globally, if the Server is provided statically. Lumen’s Client as well as Server is Platform independent. The Server is technically flexible to be installed and configured with a variety of Application and Database servers and they can be operated in N-tier Architecture. The Client’s request is processed in a real time environment by the Lumen Server. The Server is highly resistive towards security breach and hacking as it can only be accessed through its Clients and by none other application. PS: No 3rd Party License is required to operate Lumen in the default configuration However Lumen is totally customizable product which can be altered or remanufactured as per the Client’s Functional or Technical specifications.